Greenfield Villas. 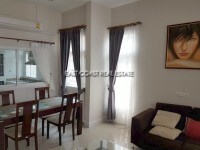 A Western built secure village 10-15 minutes out of the City Centre in East Pattaya. A very easy area to get access to the city, plus with direct highway routes to Rayong, Laem Chabang and of course Bangkok. This home is sat on 370 sq.m of land, so enough space for covered private car parking, and a nice landscaped garden. Inside, the home has been furnished to Western standards with built in furniture throughout the house, a European kitchen with large American fridge freezer, and built in washing machine. The village is one of the best maintained in the area, with very polite security guards who will never allow access unless to residents, or guests providing I.D. The roads are clean, the gardens are manicured, and there is a children\'s play area, communal swimming pool, a gymnasium and a club house. This is a really attractive house, at a very attractive price. Living area : 121 sqm.